After having purchased some Russian 4P1L tubes from a vendor in Russia about six or seven years ago, I finally got around to building a rough prototype preamp using an existing chassis with a suitable power supply already in place. 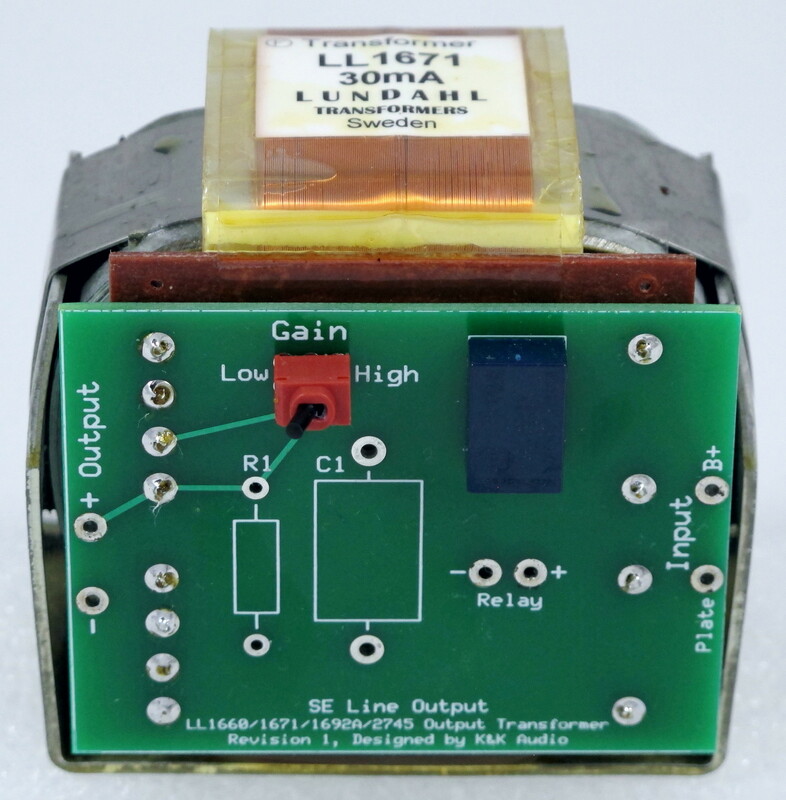 I added a Lundahl line output transformer for coupling and put it in my music listening system. After it had settled in a couple of days I knew that I was going to be doing more work on this preamp, because it certainly had a distinctive musical voice that conveyed more “real life” than did the preamp I was listening to at the time. The obvious fault of the rough prototype was noise. Using the LM317-based current source filament supplies I had, the broadband noise (“hiss”) and “buzz” was substantial. So I built another preamp in a chassis I often use for more “advanced prototypes”. I added Coleman regulators (thanks to Rod Coleman for these) for the filaments and used cathode bias with the filament current passing through the cathode bias resistor (thanks to Andy Evans for this idea), which enables you to skip the cathode bypass capacitor altogether without the usual negative sonic effects. I also added a main high voltage shunt regulator in the form of one of the K&K Audio kits. This version was certainly nicer sounding and somewhat quieter than the first, but still suffered from some buzz. Ultimately, I developed the current versions of the modules I am presenting below using this experience. With the parts now on a larger piece of plywood (see the photo and try not to cringe) to facilitate a better layout and the beta modules, the sound is better yet and the buzz has been all but eliminated. This is one very fine sounding preamp circuit! It provides a rich, open presentation that has plenty of weight, but also delivers musical detail in a way that allows one to follow harmony lines as never before. The “recreation” of space is done in a pleasing, but not exaggerated way. In my system, the soloists are not recessed in the listening room, but are present up-front and arrayed across the “stage” in my room, giving many performances a degree of intimacy that often seems lacking with other preamp circuits when compared to the memory of live performances. Dynamic contrasts are dramatic where the music requires them to be, but soft passages are rendered with delicate precision. 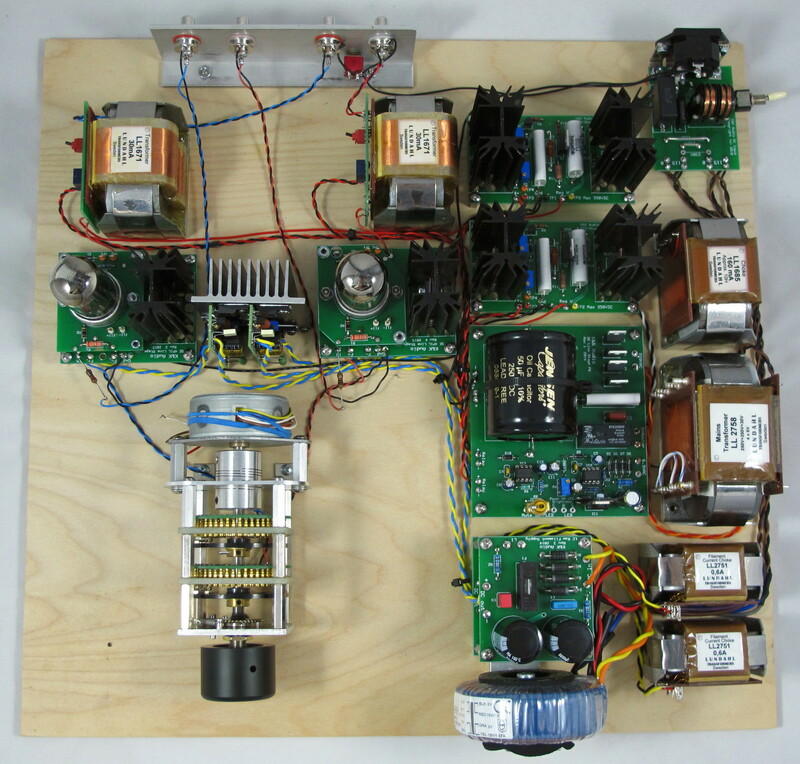 Of course, a power transformer, volume control, input selection, and some kind of plate load for the 4P1Ls are required for a complete preamp. I completed my prototype using a Lundahl 2758 power transformer, an LL1685/130mA choke to make a choke input HV power supply and two LL2751/0.6A to make choke input filament power supplies, a stereo shunt volume control, and, lastly, a pair of LL1671/30mA output transformers as plate load and coupling transformer. 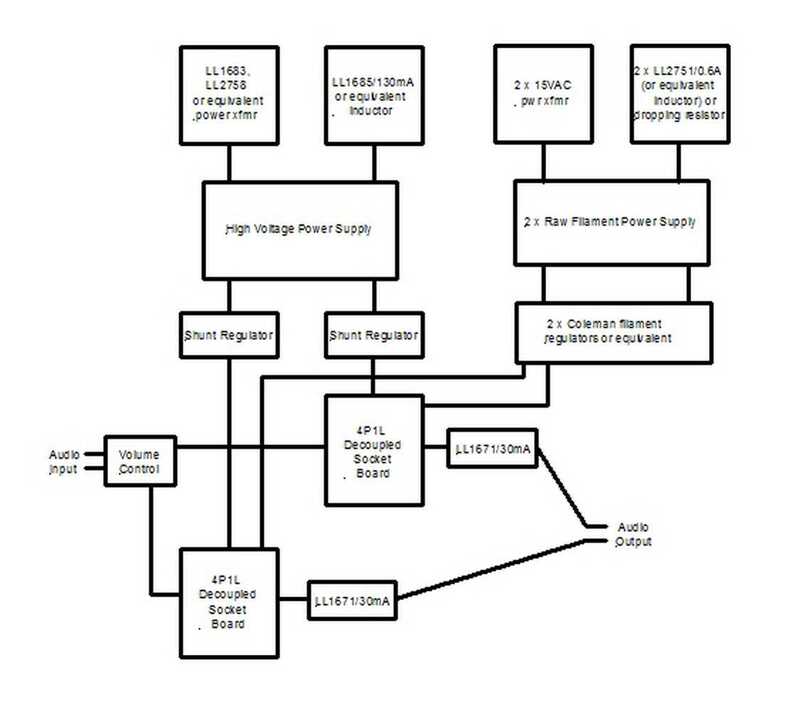 The block diagram shows how these parts all relate to each other. Of course, you can use many of these same kit modules to make a preamp with, for example, 26, 30, 56, or 01A directly heated triode tubes, too, so you aren’t limited to the 4P1L, a plentiful, but admittedly arcane Russian tube. 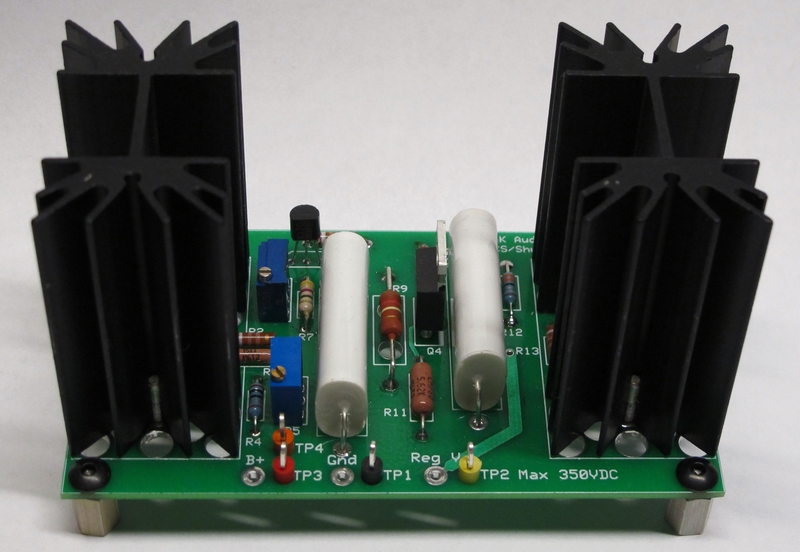 This kit takes 250VAC (or 500VAC CT with modification) and 6.3-12VAC and provides a passively filtered high voltage DC output. It is designed to be used with a choke input filter, so connections for the PS choke are provided. For Lundahl chokes the superior “common mode” connection is accommodated. Other chokes can be used by adding a jumper to the PC board. The kit adds two other functions that are useful. The high voltage is delayed for 30 seconds after power is applied, to allow filaments to warm-up and stabilize. A second time delay set for 45 seconds can be used to release mute relays that mount on the output transformer PC boards, ensuring that no ugly sounds reach your speakers during turn-on. These relays simply short the output signal when not energized, so there is no “relay sound” added to the audio signal. A place to add a manual switch for muting is also present as well as LEDs for power on and mute on, if these are useful to you. Given that many have high voltage filter capacitor preferences, the kit is offered with three alternatives: no capacitor (use your favorite), the 30mF 600VDC Mundorf TubeCap, or the new Jensen Capacitor metallized polypropylene in oil power supply capacitor (50mF 250VDC). 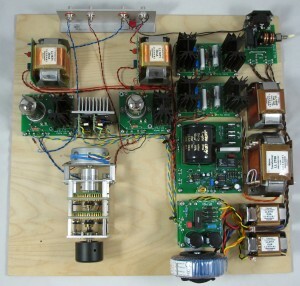 The board is also laid out to accommodate conventional snap-in electrolytic capacitors, and a couple of models of readily available 4 wire DC-Link type caps that are similar in construction to the Mundorf part, but offer “Kelvin” or 4 lead performance. This combined current source / shunt regulator kit has been designed to provide a high quality, simple-to-implement regulator to isolate amplifier input stages from the raw power supply. 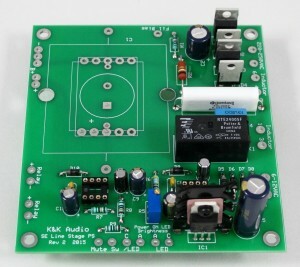 The current source part of the circuit is identical to that used in the K&K Audio Cascode Current Source Kit. 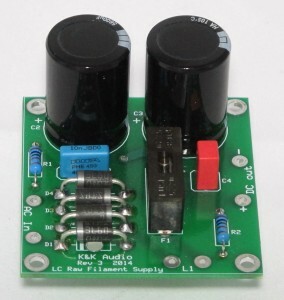 The shunt regulator circuit is similar to that originally developed by Salas (http://www.diyaudio.com/forums/power-supplies/134801-simplistic-mosfet-hv-shunt-regs.html). It’s a simple circuit that performs very well, like the cascode CCS, and is stable under a variety of operating conditions. The shunt regulated voltage is set by a simple JFET current source, which controls the shunt transistor by means of a driver transistor. An RC network across the output manages the transient response to provide quick recovery from transient demands without significant overshoot. 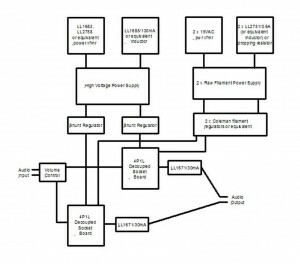 The regulated voltage is adjusted using a trimpot that sets the current through the reference current source, allowing you to easily determine the best plate voltage for your design. This power supply kit is used to provide well-filtered DC for the filaments of directly heated tubes, such as the 4P1L, 26, 01A, 45, 2A3, 300B, etc. Normally it would be followed by a regulator like the Coleman regulator, but could be used without one for power output tubes, as the LC filtering is pretty effective at minimizing ripple. Schottky diodes (3A or 5A) and an RC transformer snubbing network minimize noise, while an on-board fuse protects against regulator faults. The power supply is most effective with a choke (purchased separately) wired in, but a higher wattage resistor can be used in place of the choke to get better filtration than with a capacitor alone and also serves as a means to “adjust” the voltage out. This kit uses the first of these methods to reduce the effects of microphony on the audio signal. A high quality loctal socket has been constructed directly on a PC board using gold-plated Mill-Max pin sockets. The board with tube mounted is suspended above another board with very compliant “sandwich mounts” to provide decoupling from the chassis. Connections from the external circuit are made to the bottom board to prevent wire transmitted microphony. The socket board and the connection board are wired together with short S-shaped pieces of 35ga. copper wire. 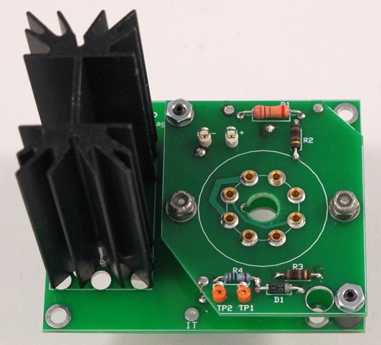 The connection board also includes heat sink space for the relatively high wattage cathode resistor necessary for accommodating filament current flowing through the cathode resistor. Cathode resistors are not supplied, but I use Caddock TO-247 style thick film resistors that are readily available from Mouser or Digi-Key. If you don’t like these, the space can accommodate “aerial” mounting of large resistor on insulated turrets, as well. Rod Coleman has developed and refined a “filament regulator” for directly heated tube filaments that is widely considered to be “very good stuff”. If you wish to be informed you can find the threads covering this quest on www.diyaudio.com or the result on www.lyrima.co.uk/dhtreg/dhtRegIntro.html . I won’t try to recap the story here, because I couldn’t do it justice. The Coleman regulators are a product of Lyrima, Ltd in the UK. We will stock these here assuming there is enough demand to do so. We also limit their purchase to K&K Audio customers who are purchasing SE preamp modules. Our pricing is such that we pass them along to you to facilitate your project, not to make us rich ((;+).